Madame Tussauds, San Francisco Dungeon, and Alcatraz are three of San Francisco’s most intriguing attractions. On this exciting combo tour, you’ll have the opportunity to experience all three on the same day. Explore Madame Tussauds, a wax-figure museum where you’ll see life-size sculptures of celebrities, politicians, athletes and local icons. Right next door is San Francisco Dungeon, which tells 200 years of the city’s gruesome history. 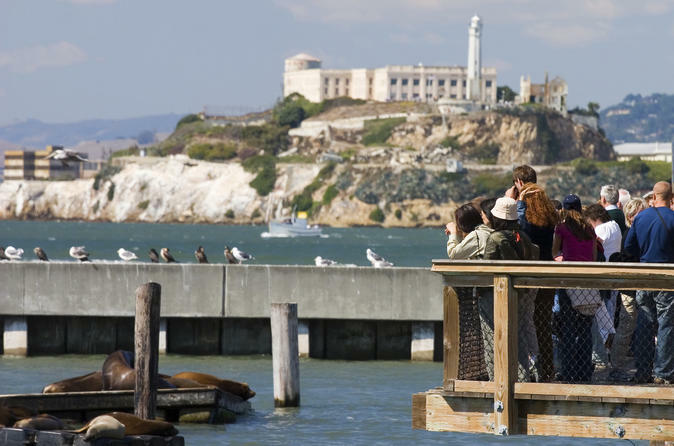 Then, head to Alcatraz Landing, where you’ll catch the ferry to ‘The Rock’ and explore the prison cells that once held America’s most-wanted criminals. Your combo tour begins at Madame Tussauds, a wax museum in San Francisco’s famous Fisherman’s Wharf district. But this isn’t your predictable dusty wax museum. With celebrities, famous politicians, A-list athletes, it feels like you’re walking through a series of performances frozen in time. Take a bow with Elton John, get up close and personal with Marilyn Monroe and explore the rest of the dozens of incredibly lifelike figures. You’ll see today’s hottest actors, like George Clooney, Kate Winslet and Leonardo DiCaprio, as well as leaders like Barack Obama. And there’s a special exhibit just on Bay Area figures and prominent San Francisco icons. Take a peek behind the scenes and see how these life-size models are created by the experts. Be sure to give yourself at least an hour to explore the museum. Next, visit San Francisco Dungeon. This interactive theatrical experience at Fisherman’s Wharf covers 200 years of San Francisco’s often dark and dirty history. You may laugh, you may scream, you may end up in the clink — it’s all part of the fun as live actors draw you into their fascinating tales of the Gold Rush, Alcatraz, Chinatown and more. Allot approximately 5 to 10 minutes to walk through Fisherman’s Wharf to Alcatraz Landing. The next part of your journey kicks off with a scenic, wind-whipped ride across San Francisco Bay to Alcatraz Island, aka ‘The Rock.’ You’ll have breathtaking views of the Golden Gate Bridge and the San Francisco skyline as you approach your destination. In the past hundred years or so, Alcatraz has gone from military prison to maximum-security penitentiary to National Park Service site. You can tour the cells that once held America’s most notorious prisoners, including Al ‘Scarface’ Capone. The roughly 2.5 hour tour will give you a captivating overview of the intriguing, and scary, history of this little island on the bay. Your tour ends with your ferry ride back to Alcatraz Landing. Special Offer - Book and travel by March 31 and save 16% off our previously offered price! - Book Now!